It’s 7 am. The air feels cool. 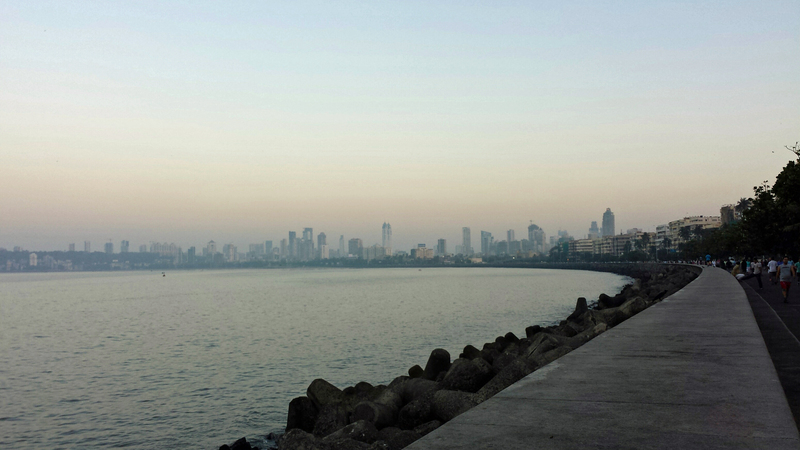 Mumbai’s pride; Marine Drive, is awake and alive. 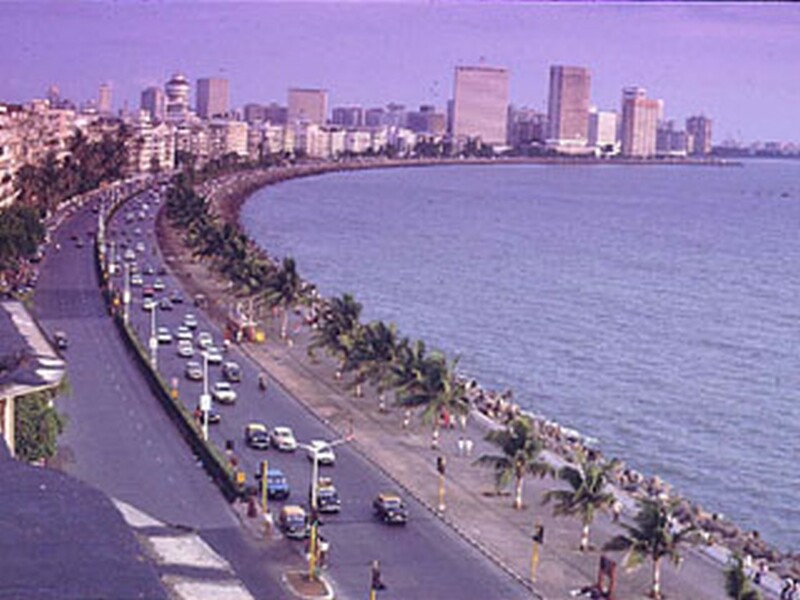 The broad promenade stretches along the Arabian Sea. In the evening, the shining lamp posts form a necklace, the Queen’s Necklace as they call it. Beautifully rounded, accompanied by the waves that steadily hit the rocks. But it’s early morning now, the sun is about to rise and break through the morning mist. 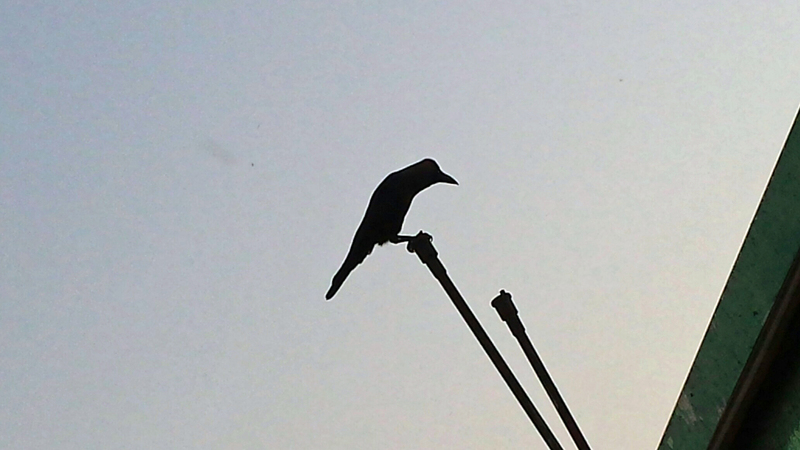 A faint breeze strokes my chin as I listen to the ever present Mumbai crows. To the north, the skyline stretches towards the sky, mostly made by the high-rise buildings of fancy Malabar Hills. They seem quite a distance away behind a haze of mist, or smog as it might well be. I turn around and my gaze falls on the Air India building, who has become my landmark. Tall hotels together with ordinary corporate buildings form the Northern skyline. People come to work here, but right now, people come to walk. They walk alone, or in pairs. In long strides, and short strides. 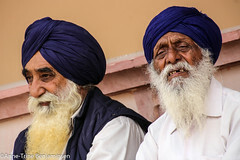 The men, retired perhaps – in their white, big jogging shoes. Loose trousers, shirts with rolled up sleeves. Some stroll along leisurely, some walk briskly. They walk the talk. Old colleagues, neighbours, brothers, friends. Twos and threes, sometimes in fours. Then there is the retired couples; the women in their salwar kameez and a woollen cardigan on top of it. It’s still cool for a Mumbaikar. The wide trousers flutter around old legs above big shoes. Good shoes. They don’t talk, there is no need. They walk. Before the sun emerges and makes walking unbearable. Some wear track suits, swinging their arms energetically from side to side. More men in groups, friends on a daily morning round. Glasses blinking, hands agitatedly waving the air. They could be discussing politics. Shouting friendly at each other. Or just keeping quiet. An old woman walks towards me, she is wearing a burka. She sits down next to me, breathes heavily. She seems distressed, restless. After a while she heaves her heavy body and leaves, perhaps she needed a rest. A suffering body or a suffering mind. A young man is chasing a football, all by himself. The ball goes this way and that, always captured by the man who puts it back on track. He’s moving along with the ball, in between people. Nobody interferes. I follow him with my gaze, soon the restless figure is lost among the people. The stream of people thickens. The sun is about to break. Four women is sitting side by side, chanting. Om, they chant. Ooomm… They are unmoved by the stream of people, by the looks of any odd tourist. Closed eyes, deep in concentration. The concrete wall along the promenade doubles as a bench. People also walk on top of it, or they sit down cross legged with their faces turned towards the sea. Contemplating; about the day that lies ahead or even life itself… Even at this hour, some young couples sit close together, captured in secrecy perhaps, a more than common sight in the evening. Some do yoga, stretching their bodies towards the soft sky. Some is lost to the world in deep meditation. Or, we simply let our gaze wander. Up and down the promenade. Thinking how lucky this overcrowded, polluted, dirty megalopolis is to have such freedom and space for everybody to share. The joggers emerge among the walkers. Long trousers, short trousers. A woman in a sari even. Chubby young girls adamant on losing a few kilos, their feet heavily touching ground; bump bump. Sweat foreheads. Alone, but also in pairs. Mutual struggle. Mutual pain. Being two is always a small comfort. Athletic men in shorts glide along, fancy sun glasses, even more fancy shoes. Expats trying to keep fit, trying to beat the forever-glaring sun, trying to keep up a lifestyle from colder countries. 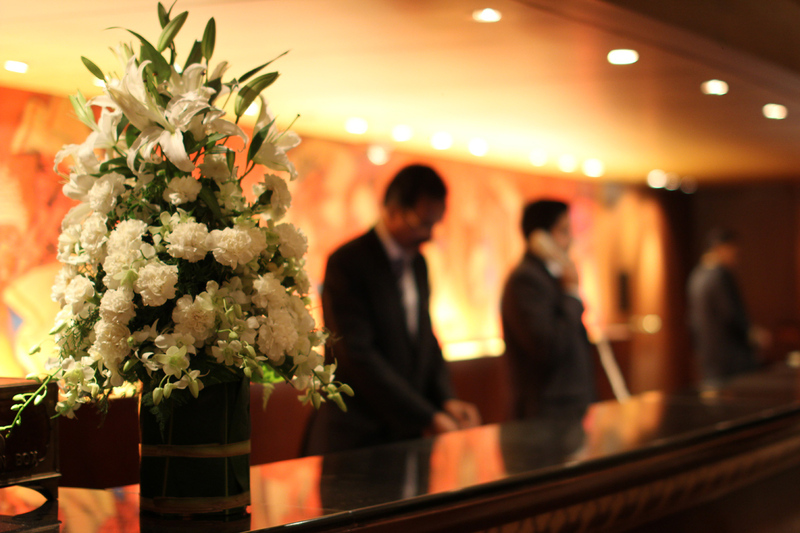 Foreign business men from nearby hotels follow suit. But people mostly walk. Arms swinging from side to side. Stretching limbs as they walk. Serious looks on their faces. Trying to fight old age. Middle aged women in western clothes and big sunglasses. Walking fast and furious. Fighting yesterday’s too many laddoos. Young girls in threes and fours. Serious sometimes. Or giggling, discussing that very special boy in school. Avoiding the many stray dogs that scuttle about. 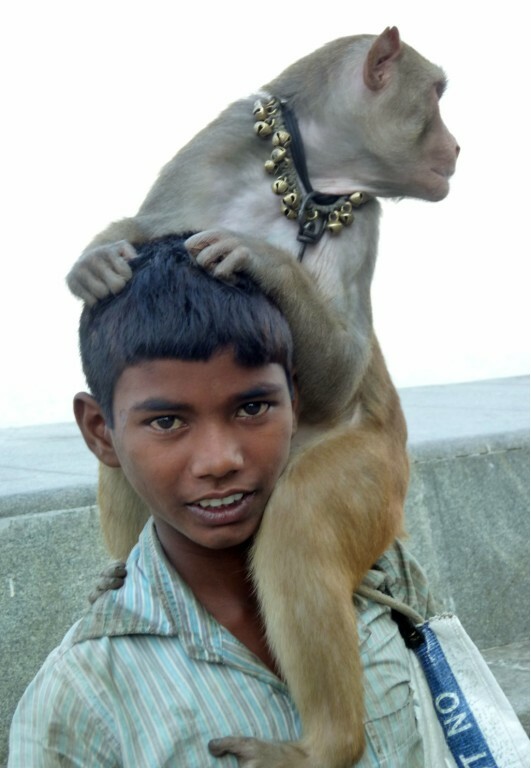 And there he is; the little boy with the monkey in a chain. Frowned upon by the regulars, but always attracting interest from tourists before they realise he’s not there to entertain, but to earn a living. I’m leaving, still not at risk while crossing the street. 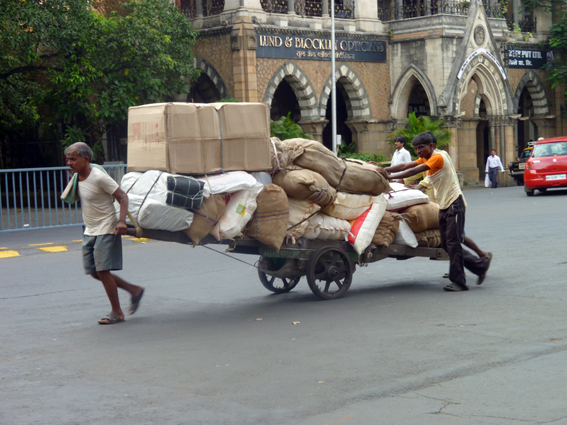 Walking towards the Air India building, and then straight ahead on uneven sidewalks towards Colaba. The odd stalls are coming to life along the way, people are queueing for their buses, the Oval Maidan is quiet, but the traffic is picking up as I reach the other side of the city where the sun has hit the Indian Sea with full force. 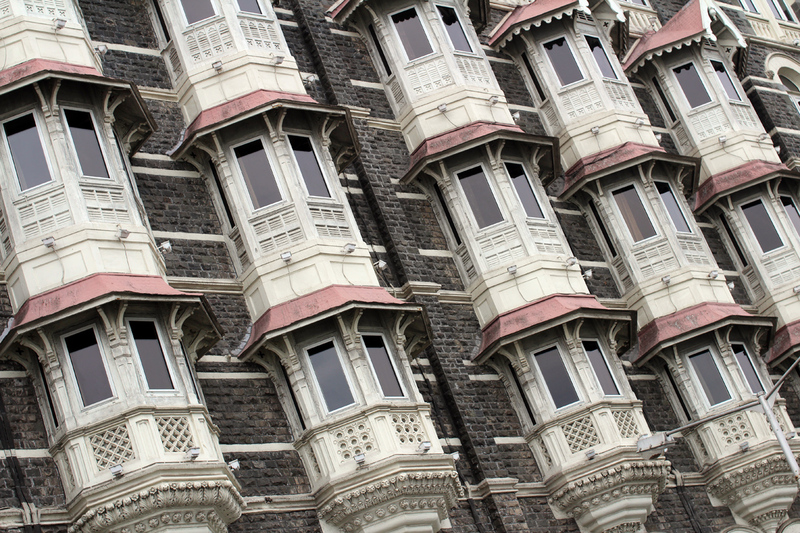 “Why do you feel you have to excuse yourself for staying at the Taj…” A Mumbai guide said. She was showing us the south of Mumbai and I told her with some hesitance that we were staying at the one and only, the legendary Taj Mahal hotel. If it hadn’t been for a friend, who insisted we stay there, I would have ended up at Suba Palace, only a few blocks away but more than a few rupis cheaper. A part of the beautiful facade. The Taj… as people say, yes it can set you back quite a few rupies – at the same time it’s manageable. And once you’re there, although in the cheapest wing and the cheapest room – which you’re sharing with your friend of course, your’re treated with a rare subdued respect and pleasantness. The whole hotel buzz with activity, but every sound seems muted. The interior is grand; and creates a fantastic atmosphere. The huge lobby with its many object des arts and the front desk that instinctively draws your attention because of the huge painting by M. F. Hussain, is what welcomes you once you’re “cleared”. The Taj with its recent history, the terror attacks a few years ago, has its own “airline security check” and reminds us what has become of the world. The reception area, with the grand painting of Hussain; sometimes known as the Picasso of India. Most of the time, a hotel is a place where you sleep and eat breakfast. 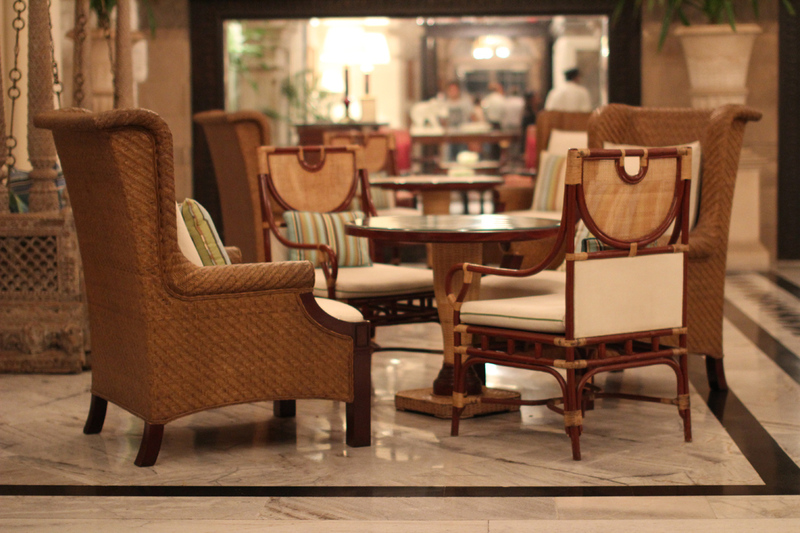 When staying at the Taj, one should take time to linger. Walk about, look more closely at everything around you, and try out some of the restaurants, – if only for the atmosphere and the service. 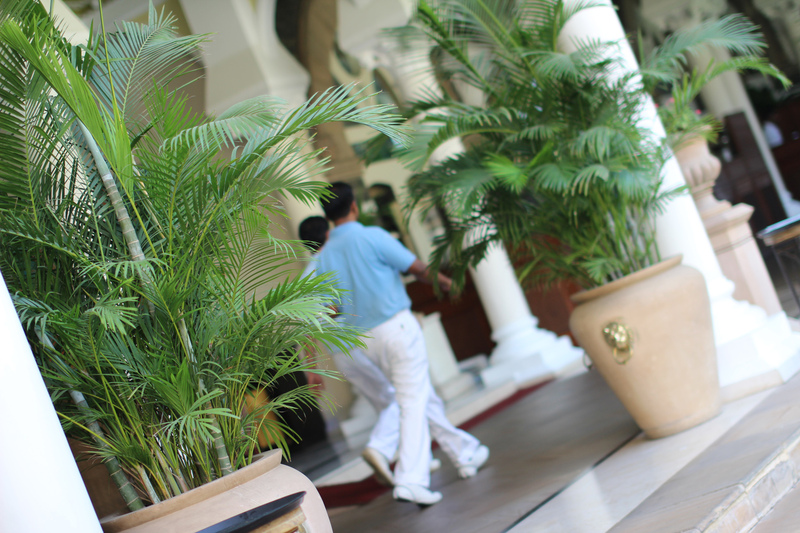 It’s even possible to take a guided tour of the hotel, which left us infatuated with the guide as well as the surroundings. Breakfast is undoubtedly an experience. We made sure to allow plenty of time every day. The outdoor breakfast area is a pleasant distance from the pool. The wrought iron chairs have lovely pillows, once you’re there you want to stay a while. And once seated, you’re taken care of by two, sometimes three waiters. They handle the tactless crows and ask if you’d like to top the breakfast with pancakes and chocolate – with the same discretion… And this is also how they place a jasmine flower by our plates, every day. When the stomach is full and the pancakes have created an uneasy atmosphere of bad conscience, we just lean back, say yes to another cup of coffee, put on the sunglasses and enjoy the – in every way – cool atmosphere. The beauty of Asia is very often the early morning hours with the heat and the humidity still lurking in the wings. The bar lounge with its beautiful interior. 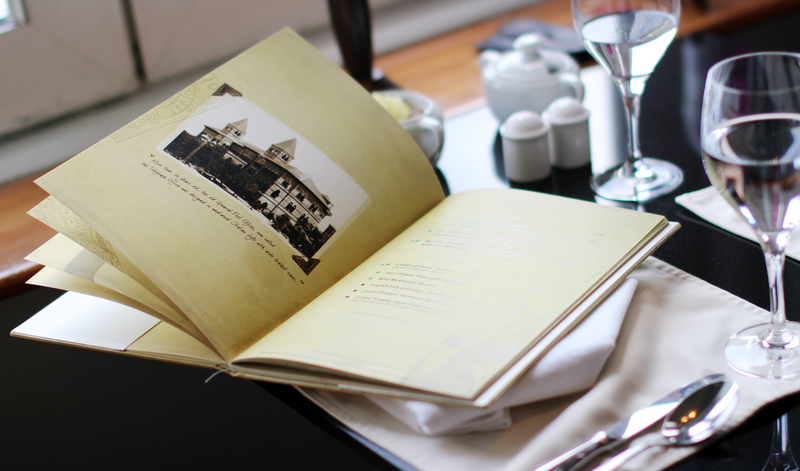 A menu is not just a menu at The Taj….. this is The Sea Lounge Restaurant with its beautiful sea view. Unbeatable…. 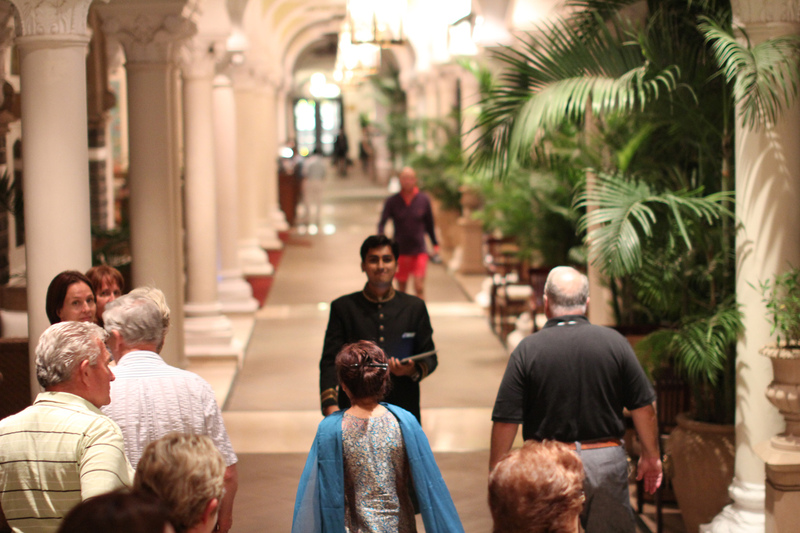 A guided tour of the hotel should not be missed. At the same time it is difficult not to think of life outside the Taj walls. The noise is there, more audible by the hour. The honking horns, the various wallahs shouting for attention. You know about the begging children, the newborn babies in their mother’s laps, people with handicaps you wouldn’t believe existed. That is why I feel uneasy about staying at The Taj, because it doesn’t feel right to spend money like that and enjoy the luxury. 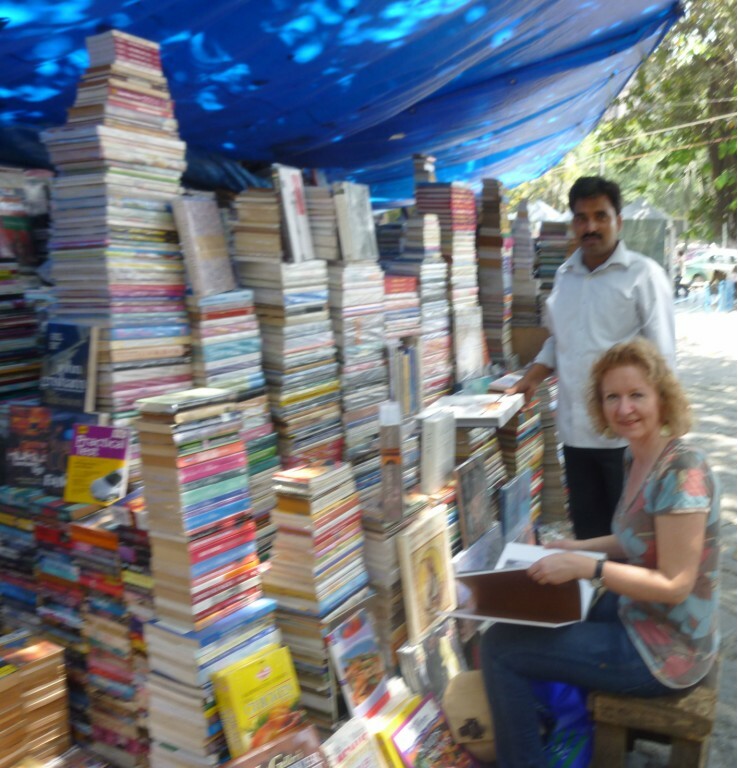 Why is India a shopper’s paradise…. 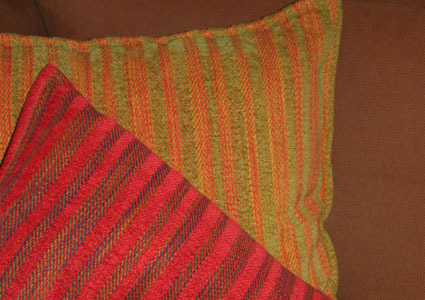 Among other things; the irrisistable beautiful, colourful textiles…. In the book I’m reading right now; Planet India by Mira Kamdar, she writes about retailing in India. And tells the story behind FabIndia. Every time I go to Mumbai, I visit FabIndia in Kala Ghoda: A symphony of colours spread over three floors and a quiet cafe – with exellent coffee – as well. 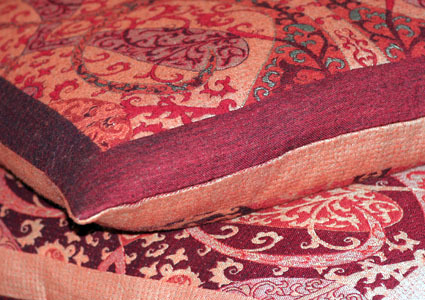 They sell clothes, all kinds of textiles and other stuff for your home, organic food, organic personal care… FabIndia was in fact founded by John Bissell, an American who came to India in 1985. 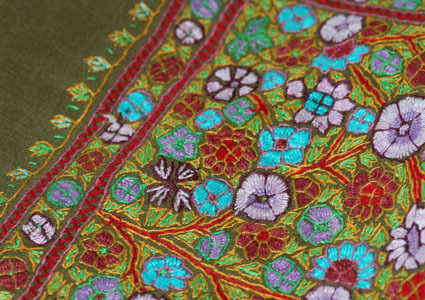 He fell in love…, with both a woman and Indian handicrafts. Qute understandable! FabIndia is now run by his son William. 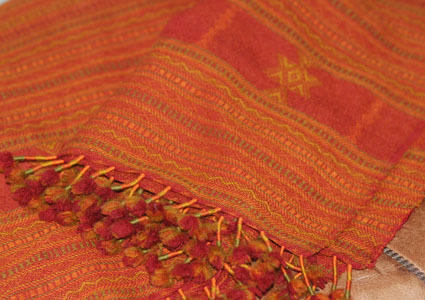 A big, beautiful woolen shawl from FabIndia. 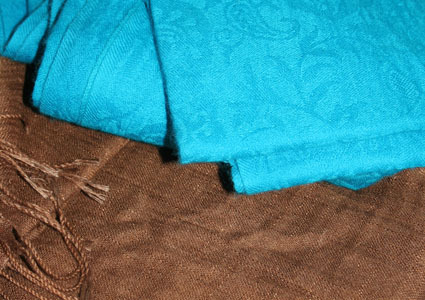 I have many Indian shawls… The word shawl is in fact the Persian word for “a piece of wollen clothing that you wrap around yourself. 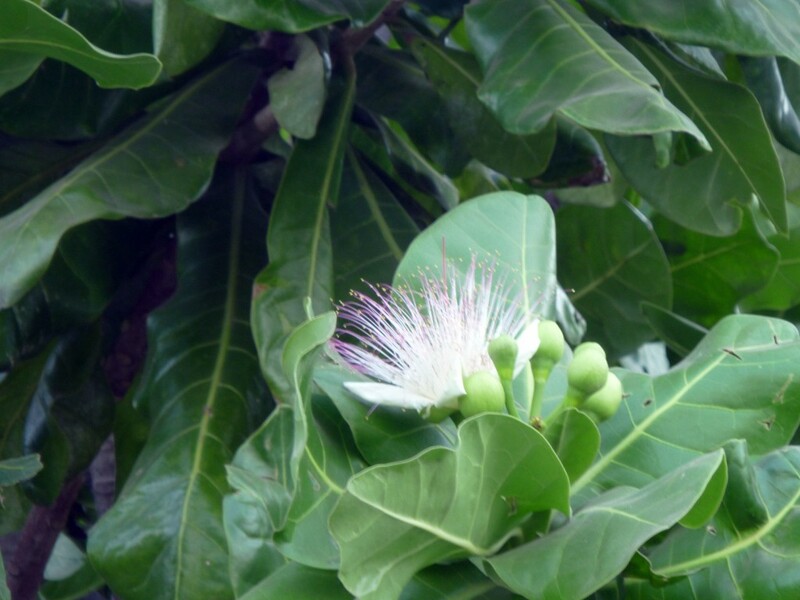 ” The first I bought, and also one of mye dearest, I picked up in Cochin, state of Kerala. 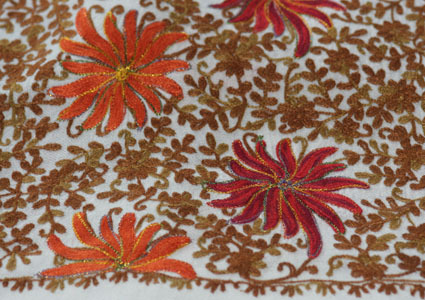 Black wool with golden embroidery. 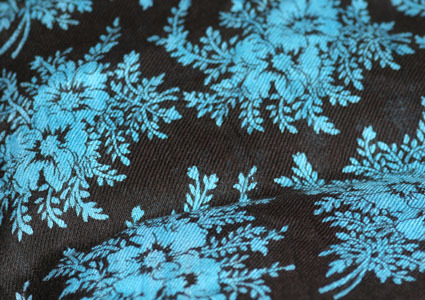 It’s always diffiult to chose among “a million” beautiful samples; the patterns, colour combinations – it’s endless and overwhelming.After many visits to India, I have now chosen quality before quantity. Shopping from the street markets is cheap, the haggeling is fun and the exciting feeling of getting something really, really cheap is always there…. 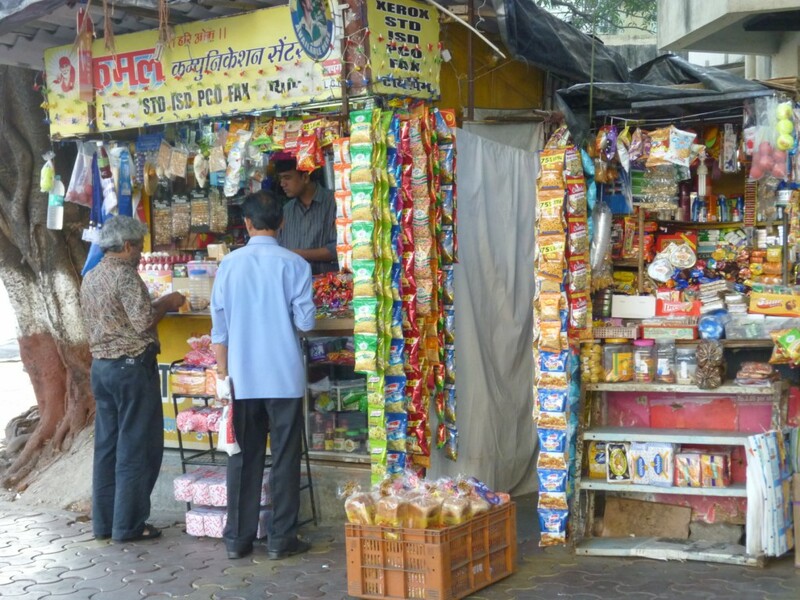 But once you step indoors, especially in Colaba, prices leap upwards and so should quality. For the most part I believe I’m paying the right price even when I feel it’s a bit over the top, but you never know…. 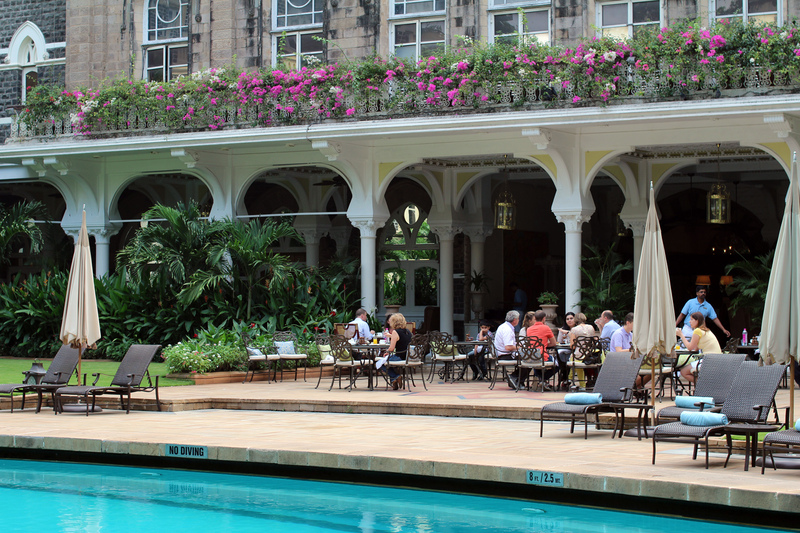 Some years ago I discovered Maspar just behind the Taj Mahal Palace in Colaba. Quite a big store for home furnishing: colours…. quality…. I wanted to revisit in 2010, but alas, the shop was gone. It wasn’t until last year, when I sat in the car from the airport to Colaba that I spotted Maspar under the bridge at Kemp’s Corner. So I went back a few days later, just to disover that the shop had shrinked considerably. The shop assistant told me that after the terror attack against Taj Mahal Palace had made safety precautions in the area extensive – and thus clients had vanished.My best shopping tip? go and have fun………..and buy something for your mother and sister as well! 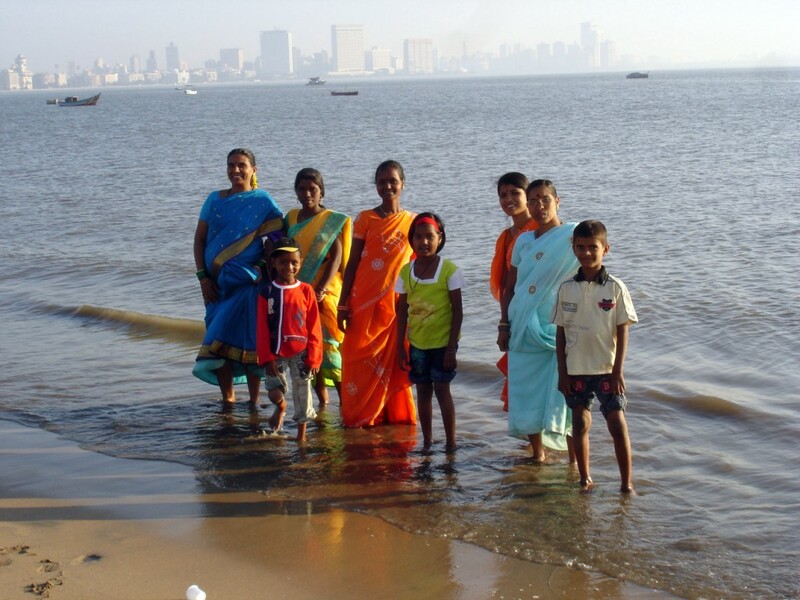 Family life at Chowpatty beach! Since I prefer to stay at Suba Palace in the south of Mumbai, Marine Drive always comes as a relief after a long taxi ride from the northern suburbs. Yes, the traffic very often comes to a standstill here as well, but at least one can watch the Arabian sea on the right hand side. But at one point the taxi has to turn left and hit into the ‘jungle’ once more. 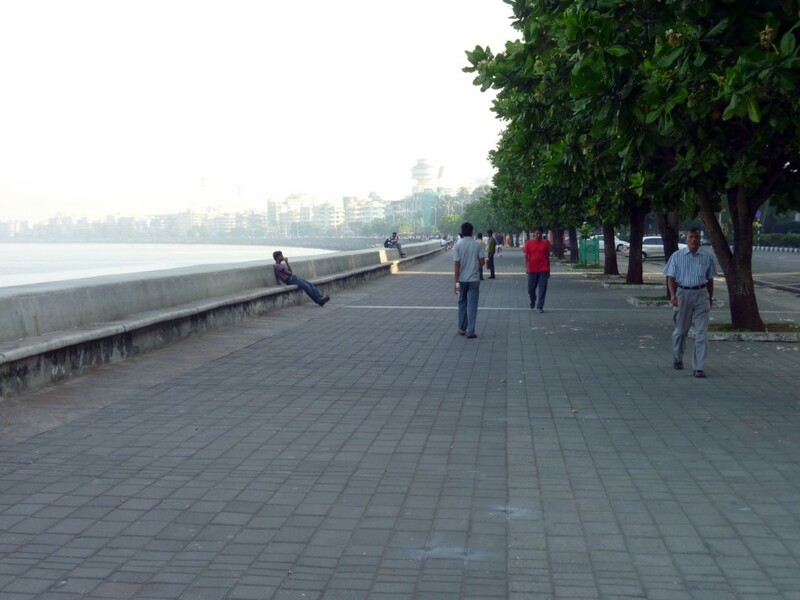 The highlight of Marine Drive is the beautiful promenade along the road where many Mumbaikars take in a breath of fresh air and view the setting sun. The promenade is lined with palm trees. At the northern end of Marine Drive is Chowpatty Beach. 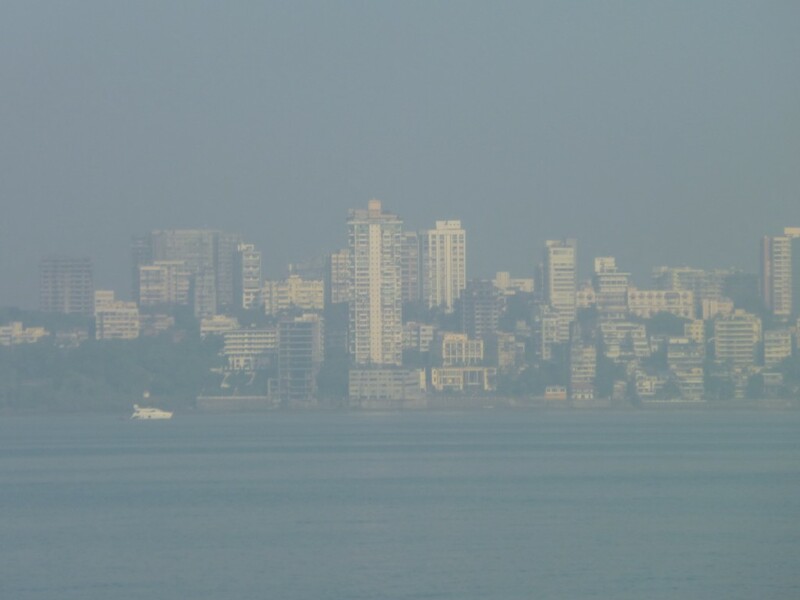 A friend of mine had heard of Chowpatty and wondered if she should bring her bathing suit. Well, rather not. I wouldn’t dare lower my body into the polluted water, neither would I think it suitable to appear in a bathing suit. But Chowpatty is good for observing Indian family life on a Sunday afternoon. 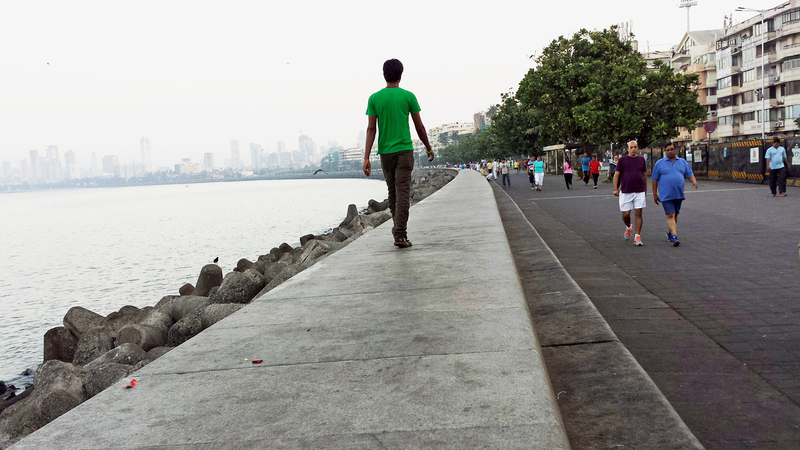 The stretch from Colaba to Marine Drive is walkable, just head for Churchgate train station. I have found a good pizzeria on a corner, so that I can eat well and at the same time watch Marine Drive. Outside the pizzeria a young woman with a child resides, I don’t really think it’s her child, beside – I have seen her with different ones. 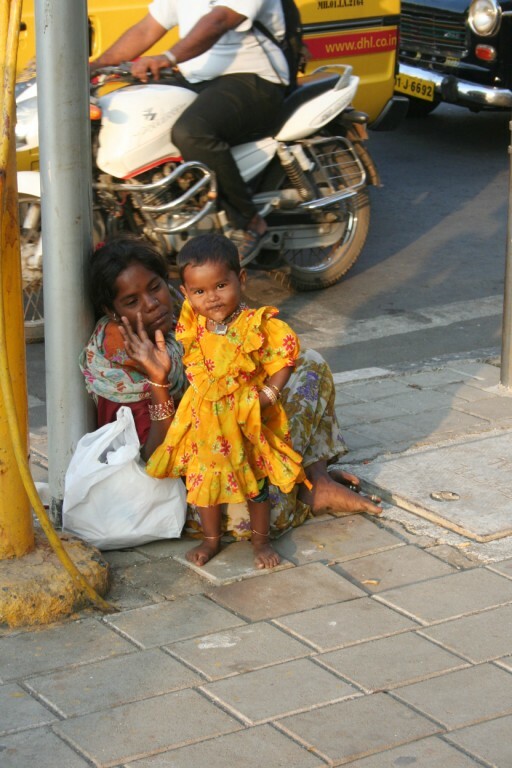 She begs from the pavement, sometimes she walks out in the street to beg among the cars. I think she is given left overs from the pizzeria. At least I hope so. 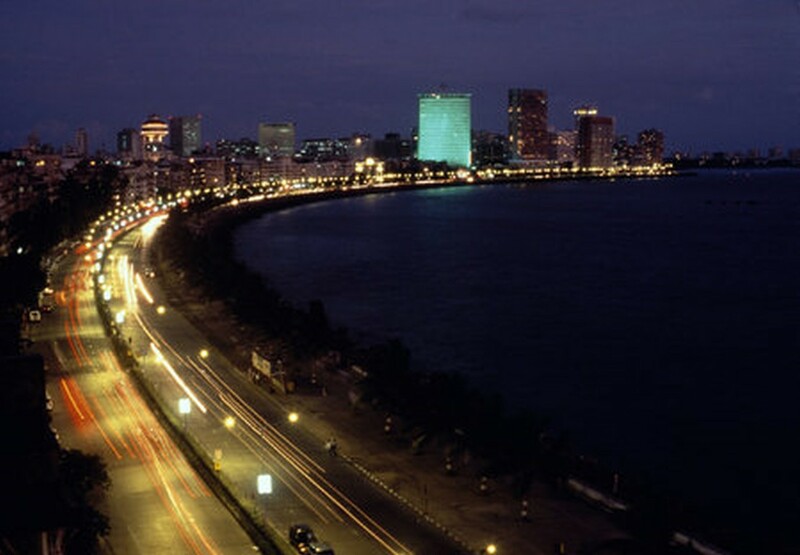 Marine Drive is lovely during night, when all the street lamps resemble a string of pearls and forms “The Queen’s Necklace”. The boulevard is full of young couples, maybe their one and only escape from congested living conditions and extended families. When you’re on holiday, there is always The Last Day when you very often feel restless, a day difficult to enjoy in full. Sometimes, when you’re on a low-budget airfare trip to Europe, the last day means getting up at four in the morning in order to catch a 6-ish plane back home via, say Amsterdam. So in that case there is barely a last day, only a bad start of the day. Travelling home midday is probably ideal; after checking out of the hotel there is nothing much left to do but to go to the airport and hope the tax free shops are good… Travelling home at six in the evening, well… it’s OK if the weather is warm and sunny and you don’t really miss a hotel room. Travelling back home from India, well that can be a challenge. Lufthansa is definately worse than KLM. Lufthansa leaves Mumbai at approximately 3 30 in the morning. Now that means many hours to while away without access to a hotel room. KLM is slightly better, leaves Mumbai right after midnight. Given the fact that you should be at the airport 3 – 4 hours prior to departure, and that the taxi ride from say Colaba in the south of Mumbai could take up till two hours on a bad day – you better leave for the airport around nine in the evening. But what to do all these hours in between room check-out and departure….? I was ready and prepared to go home on the 6th of November last year, but I had plans for the long and last day. But then my friend Joan called in sick in the morning. 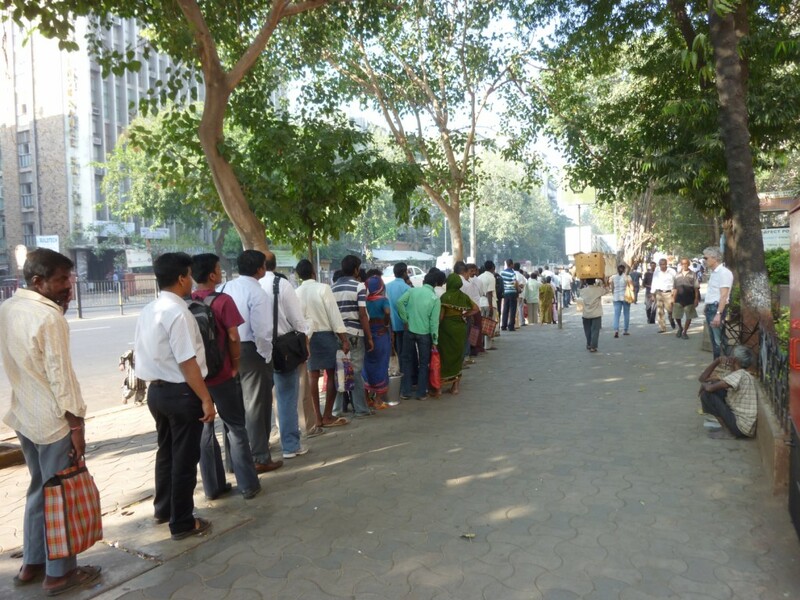 OK, I decided against going back to Bhuleswar market because I wasn’t sure I would find my way around that crowded maze. Furthermore, it felt more hot than ever…and I knew from some days earlier that the market would be terribly crowded. Better opt for a day in slow motion. Go to cafes, read, buy those last minute presents, eat, more coffee, read…. When I checked out, the hotel offered me a room for free a couple of hours prior to my departure, to relax and fresh up. Great! SUBA Palace knows how to treat returning guests! Next… When I came out of the hotel and took my usual right-left turn I almost got a shock when I entered Colaba Causeway. No market, no stalls, no vendors, almost no cars and hardly any people – and it hit me – of course – : Mr Obama was due to arrive the next morning and he was supposed to stay at the hotel only a stone’s throw from my hotel. 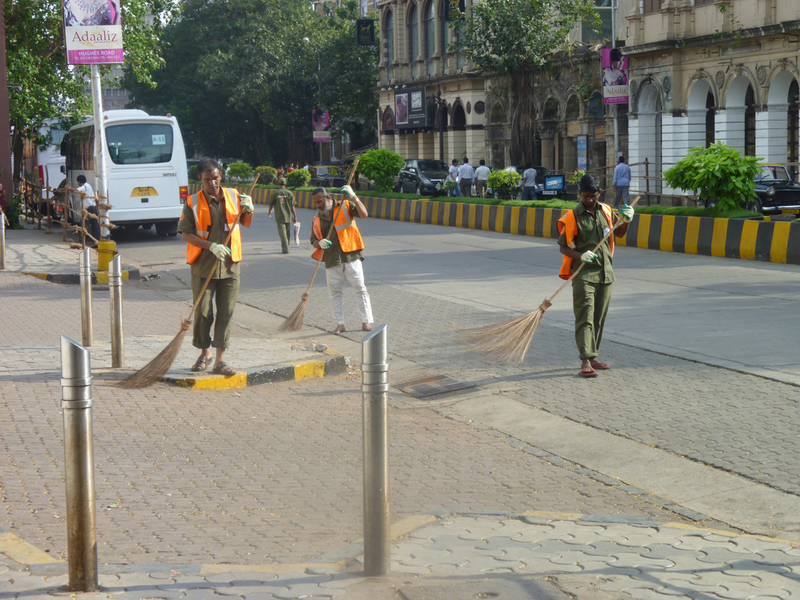 But sweepers were plentyful, cleaning the streets where Mr Obama would never set his foot. And oh, beggars were obviously driven away. I opted for the nearest coffee bar where I knew the coffe was good, and read for an hour (+ went to the toilet, a must whenever toilets seem nice and clean). When I came out I ventured down the causeway, left side southwards. Shops were open, but the causeway felt horribly deserted without the stalls. And it struck, something is not right when itæs not crowded… And in the midst of Diwali, on top of it. I hope somebody told Mr Obama how much his visit hurt on an otherwise great day for shopping. The Jehangir Art Gallery in Khala Goda, in the south of Mumbai. I visited some shops, but my jhola felt heavy on my shoulder and I decided I needed another break so I set course for the Jehangir Art Gallery where I initially wanted to visit the famous Samovar Cafe. But it was closed because of Diwali so I opted for the art gallery itself. 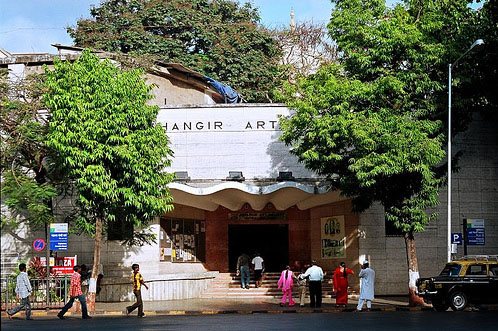 Jehangir Art Gallery is Mumbai’s most famous gallery, built in 1952. 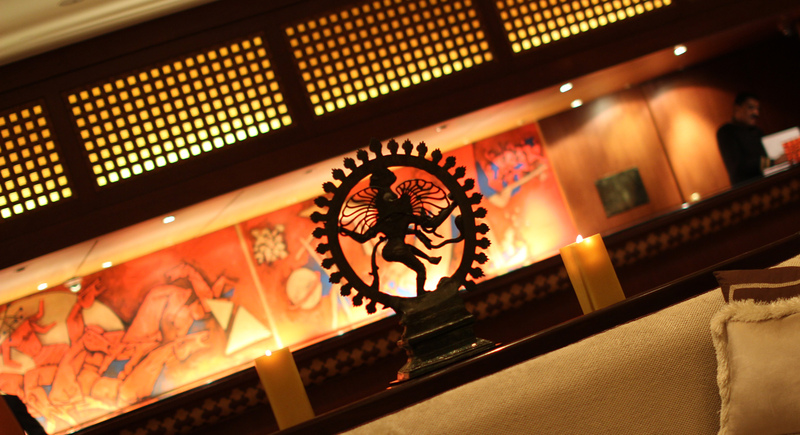 The art gallery is the most prestigious and modern venue for Indian artistes in the city. It is situated in Khala Goda (“black horse“), and area with many other art galleries. Visiting the gallery is pleasant for many reasons; the four halls are spacious and quiet and above all, it’s cool. And I needed to cool down! In the second hall the paintings caught my attention. As well as the artist himself. 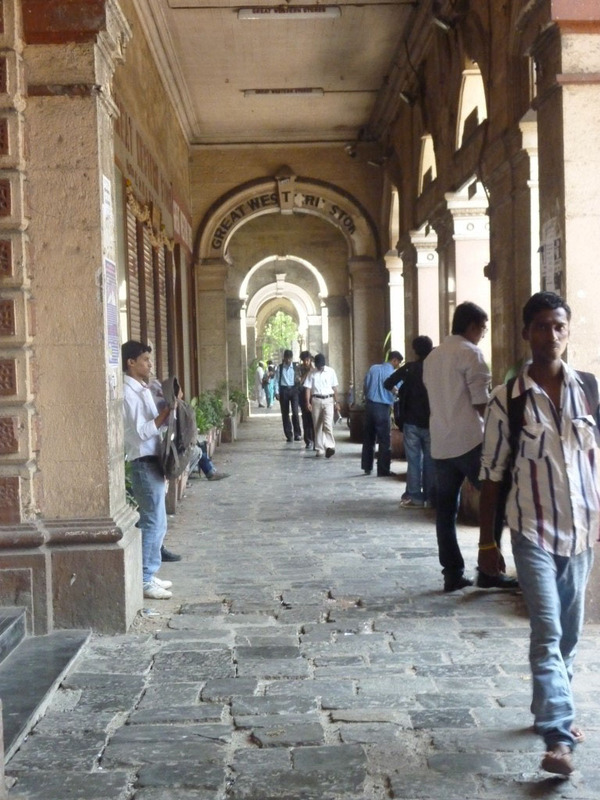 Because in India, artists spend their days in the exhibition hall, talking to visitors. The tall man, dressed as a kind of dandy, was Yaseen Khan. Oh yes, I could sense his charm when he approached me. We struck up a conversation, and I eventually asked him if I could take a picture of him, because: I like to take pictures of people I meet and talk to. – I’m not peope, he said, I’m God… Well, I don’t know God, so he could well be. When I returned after taking a look at the exhibition in the next hall, he approached me with his mobile phone, put his arm around me and we stood there listening to Air by Bach. And thus said god bye! 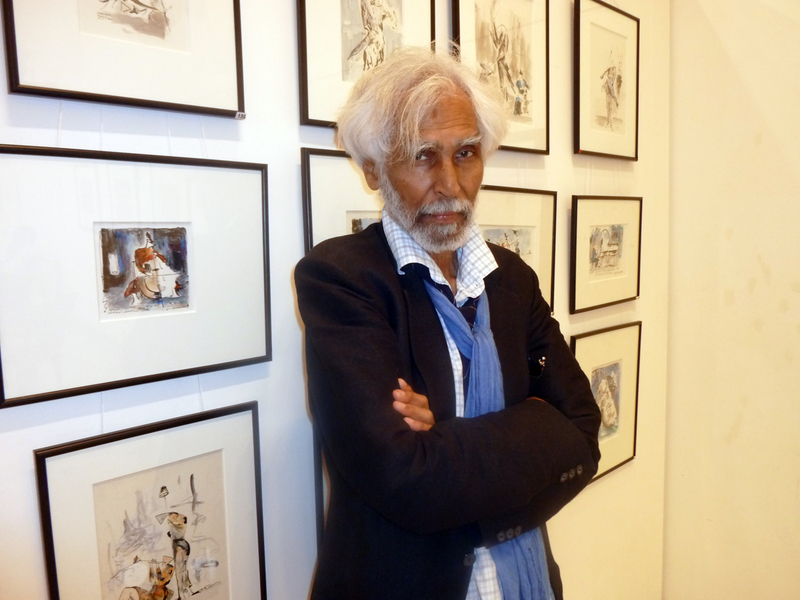 Yaseen Khan - yes, I actually liked his art! Outside the gallery I met some young people who seemed happy about Diwali in their nice Punjabi dresses. I made a halt and they asked me: – Do you want to dance with us? 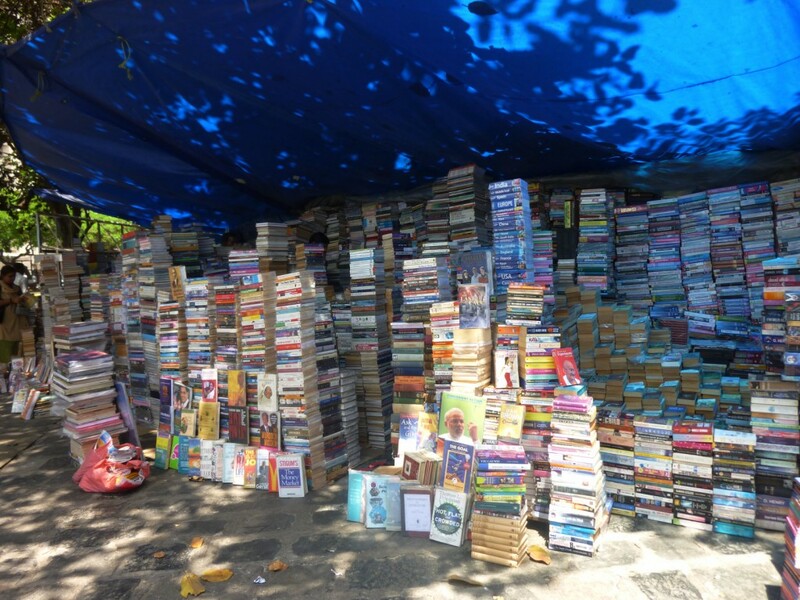 We talked for a little while and I thought of going for a walk towards Fort and the many books stalls at Flora Fountain. But decided against it, my suitcase was already 22 kilos. Instead I found a shadow and contemplated the traffic who holds everything in India. 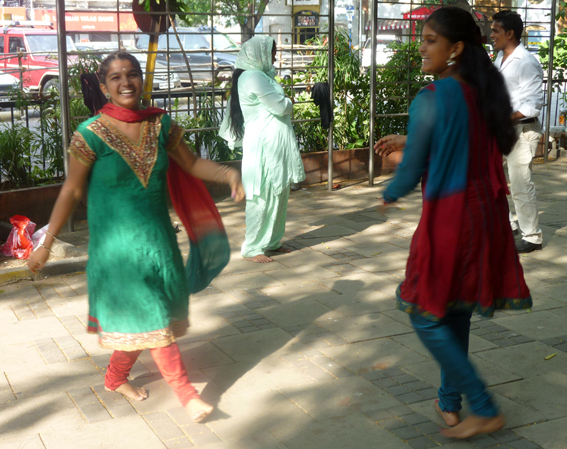 Young girls enjoying Diwali outside Jehangir Art Gallery. 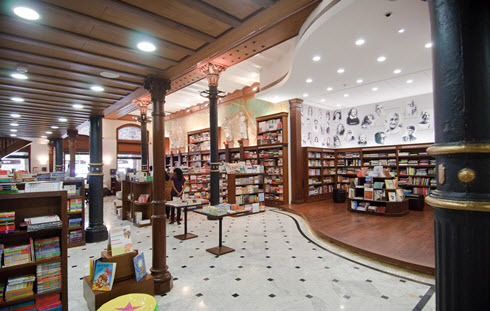 I took another stroll down Colaba Causeway and eventually found The Oak Tree, a shop I had read about. 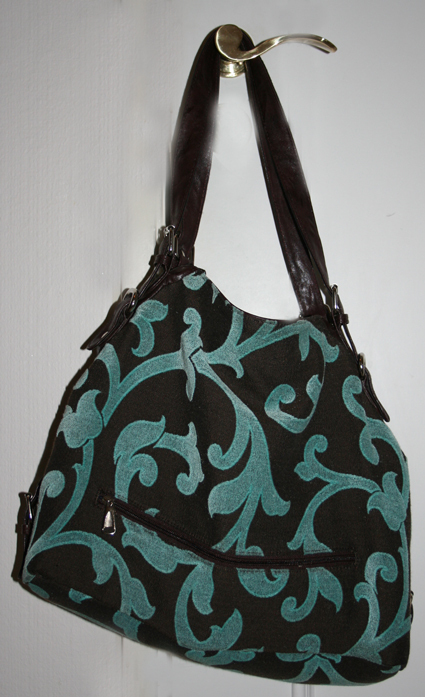 Many a time have I wondered; will I ever find a handbag in my favourite color combination turqoise and brown…? And as I entered the shop, the bag hung right in front of me. The Handbag itself. Right color combination, right shape, right size. Before checking the price tag I made and estimation; and was more or less right. I wouldn’t be ripped off, it would set me back around 500 NKr. The handbag was designed by Mumbai designer Vani Gupta, and I’m sure I will never see another one. The shop was otherwise great, but I bought the bag only (I’ll give you 10 percent off the obvious owner said) and I went next door, to Theobrama, and celebrated my prey. Strong coffee and a sandwich. And I was ready to go home to Norway!